Today the big idea I learned about at the NAIS Conference was definitely the Mastery Transcript Consortium, a fast-growing coalition of schools that I believe will soon produce a credible alternative to ABCD grades and in the process upend the tyrannical college admissions process. The intellectual leader of this movement, Scott Looney (Head of Cleveland’s Hawken School), is tenacious. He and Doris Korda, Hawken’s Associate Head, talked with prospective schools for three hours in the morning and with the 66 member schools (12 of which are joining in July) for three hours in the afternoon. Last week they were talking at the OESIS Conference in Los Angeles, where I first heard their pitch. This movement, which is less than 12 months old, aims to grow to at least 100 independent schools and create a new transcript that allows students to gain micro-credits (not grades) for a series of skills such as analytic and creative thinking, leadership and teamwork, global perspective, etc. The new online transcript meets the litmus test of allowing an admissions officer to get a decent understanding of a student’s performance in two minutes or less. Under the Mastery Transcript students gain micro-credits (not grades) for a series of skills such as analytic and creative thinking, leadership and teamwork, global perspective, etc. 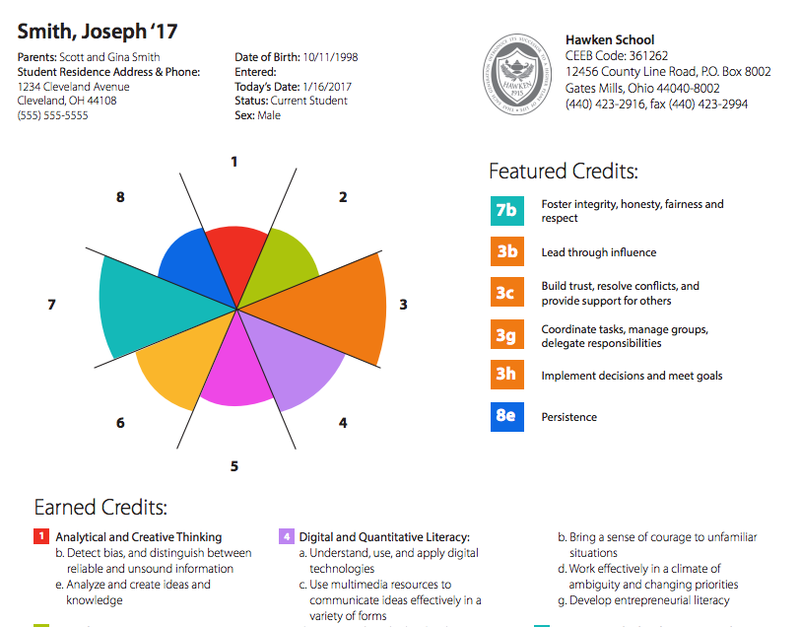 It will allow college admission officers to see a more complete picture of a student’s strengths — and without using any grades or numbers (the current idea, likely to change, is a sort of multi-colored spider web with featured credits listed at the side — see below ). Admissions officers can even click down into every skill the student has to see the standard, and then click down further to see the individual items of student work (videos, art work, writing) supporting that standard. This transcript will be hosted in a yet-to-be-built technology platform that Looney estimates could cost between $4-$7 million. Some of this money will come from member dues, but most from private fundraising and grants. The Consortium is currently pursuing a $2 million grant from the E.E. Ford Foundation. Fingers crossed. It’s an ambitious idea but I have a clear sense that this coalition, which we at World Leadership School will support however we can, will pull it off. It’s time. Our students are stressed out; teachers have inflated grades almost to the point where the grades are meaningless; schools are held back from innovating; and even college admissions officers admit the whole system is broken. Looney plans to wield the coalition’s influence to become what he calls a “credible partner” to universities — in other words, the MTC will come up with a strong working prototype and then work to gain endorsements from leading universities. Once the key colleges and universities are on board, Looney thinks it will be easier for parents and students to try the new transcript. He envisions that most MTC members will at first allow families to choose between either the traditional or new mastery transcript. So schools will have a mixture of students being evaluated in two basic ways — some receiving grades, others receiving micro-credits. The process of switching completely to a mastery transcript may take 15 years or more, and some schools may never feel they need to make the switch entirely. 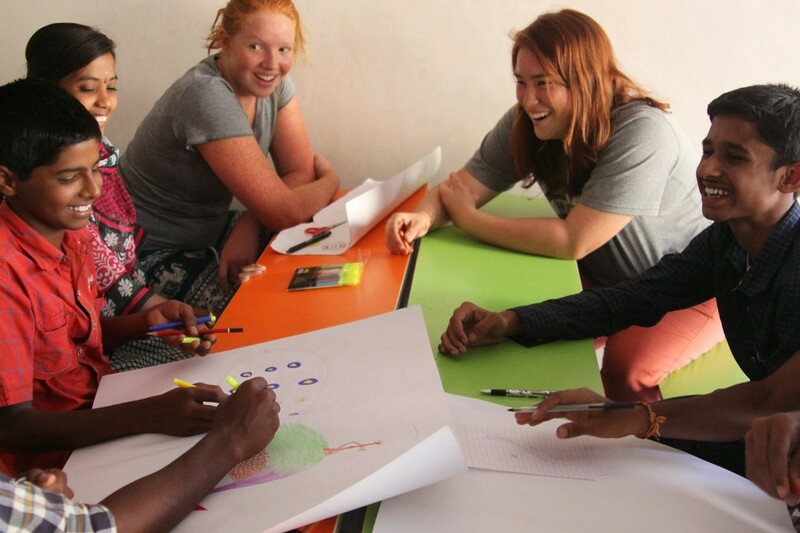 The mission of World Leadership School is to help K-12 school reimagine learning and create next generation leaders.